WELCOME TO THE DRHS HOME PAGE. 315 TO REMAIN AT C&TS UNTIL 2022. After a very successful 2017 season running on the Cumbres and Toltec Scenic Railroad, the Durango Railroad Historical Society (DRHS), owners of the restored ex-DRGW C-18, #315 and the C&TS have announced that the locomotive will remain on C&TS for the next five years until the end of the 2022 season. In 2022 the 315 will be due for its 15-year Federal Railroad Administration major inspection. C&TS has offered to carry out this task and the DRHS have agreed to contract them to do so with help from some of the 315’s regular maintenance crew. 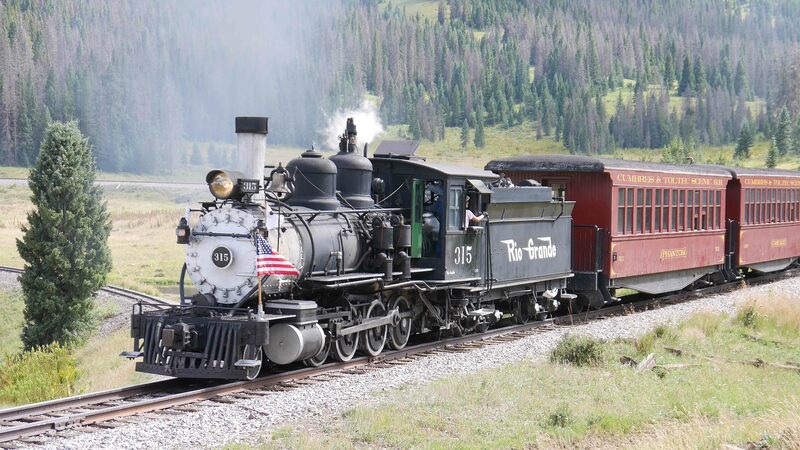 After operating on the Durango & Silverton Narrow Gauge Railroad in August 2016, the 315 was transported to the C&TS where it operated a number of specials during the remainder of the year and throughout 2017. In the latest round of grant considerations announced on June 1st 2017, Colorado’s State Historical Fund has awarded the DRHS $35,000.00. It was the only railroad related award approved. 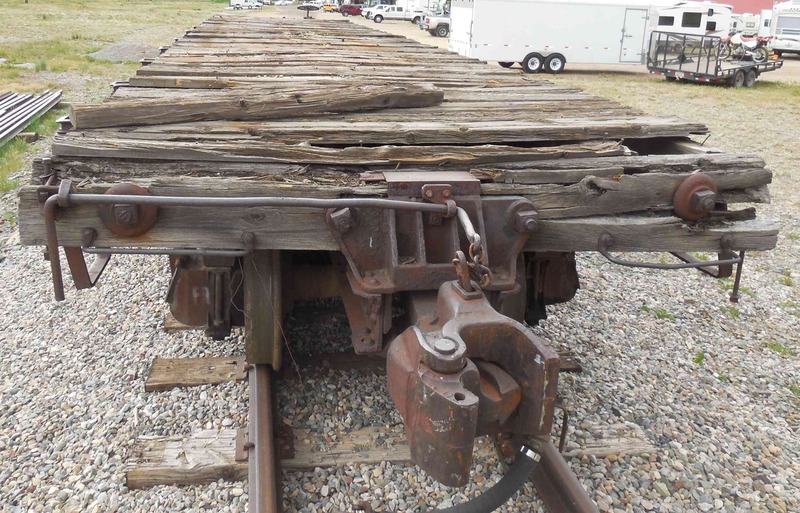 The grant represents 75% of the cost of restoring D&RGW flat car 6215, the balance coming from society funds. D&RGW flat car 6215 in its present condition. Much of the restoration work will be carried out at San Juan Timberwrights in Arboles, CO. which has previously been sub-contractor on projects like the society’s stock cars. A lot of the work will focus on the floor much of which has rotted over the years as can be seen from the photograph. The SHF grant means that both of the society’s major projects are now fully funded, the appeal for D&RGW Reefer 39 having reached it’s target earlier in the year. Still awaiting work is boxcar 3670 and water service car 04351 but the condition of these is comparatively good considering their age and the environment they’ve sat in so that restoration costs are likely to be small in comparison. RIO GRANDE SOUTHERN RE-CREATION EVENT. SEPTEMBER 4th to 6th. 315 will participate in the RGS re-creation event this fall which will feature D&RGW K-27 repainted as Pre-wreck RGS 455. For more details visit THIS SITE. This trip is sponsored by the Friends of the Cumbres and Toltec Scenic RR and the Cumbres and Toltec RR. Proceeds from the event will support the Friends of the Cumbres and Toltec Scenic RR and the restoration of D&RGW 168. The Cumbres and Toltec Scenic Railroad and the Durango Railroad Historical Society opened the the 2017 operating season of the railroad with a double header of 315 and 463 on May 27th. Starting from Antonito the double header went as far as Cumbres where the 315 was cut off. Later the 315 headed back east towards Osier with a sunset dinner special. Arriving in Osier, passengers were treated to a prime rib dinner accompanied by Chris Collins and his ‘Tribute to John Denver’. Then it was on to Toltec Gorge and the Western Prairie to watch the sunset, the train arriving back in Antonito at 9.00pm marking a great start to the C&TS season. Here’s footage from the opening day – video is by Roger Hogan, stills by Geof Gordon. UPDATE 11/21/16 – ANOTHER FOUR FREIGHT CARS RESTORED. As the weather turns colder in the San Juans so the opportunities for working on our four current projects become fewer. But the timetable for completing our restoration of two D&RGW Stock Cars, 5564 and 5627, Bunk Car 04432 And Flanger OT expires on the 31 March 2017 and the weather in Silverton between now and then prevents any work on the cars. So the cars had to be finished before the first snows of winter 2016/ 17 arrived. And we managed it. Both Stock cars, double decked 5564 and single deck 5627, had much of the rotting woodwork replaced at Arboles Timberwrights, moved to Holts Sheet Metal in Durango for refitting of doors and eventually transported to Silverton in September 2015 where they stood on the transfer track. But some work still needed to be done before they could be considered ‘complete’. That included replacing some of the door hardware and lettering both cars. First job though was to replace the floors in the doorways of the double decked car 5564. On closer inspection we found that the upper floor was in good condition and so we left the orignal in place. However the lower floor had rotted badly in the door area and the boards were replaced, painted with linseed oil and the floor edges painted black to match the rest of the car. Originally the corners of the door frames were lined with 1/4″ angled sheet metal to protect the wood. We had three serviceable liners and had five more made up by Rusty’s Welding in Ignacio, CO. The doors were missing a number of fittinga. We found two replacements for the distinctive door handles and had patterns for the door latches I-bolts and cleats and these too were fabricated in Ignacio. 5564 was missing a grab iron, brake wheel and retainer, replacements were found in our stores. Once all the missing detail parts were fitted and painted, lettering followed. The stock cars are now complete, photos taken and reports sent to the Colorado State Historical Fund which provided 75% of the funding. For further reading about the restoration of these two Stock cars go HERE. Box Outfit Car 04432 stands completed outside the SN Engine Shed in Silverton. Box Outfit or Bunk car 04432, was in better shape all round but still needed a new roof and replacement of window frames, glass and doors. 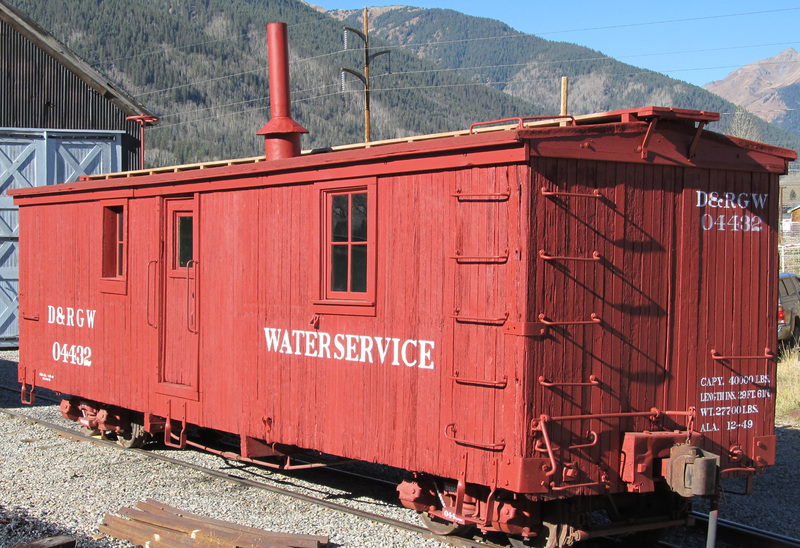 Much of the work was carried out on private land south of Durango and the car was eventually transported to Silverton where it was lettered and now stands in the Silverton Northern Engine Shed where it will winter. More on this car HERE. 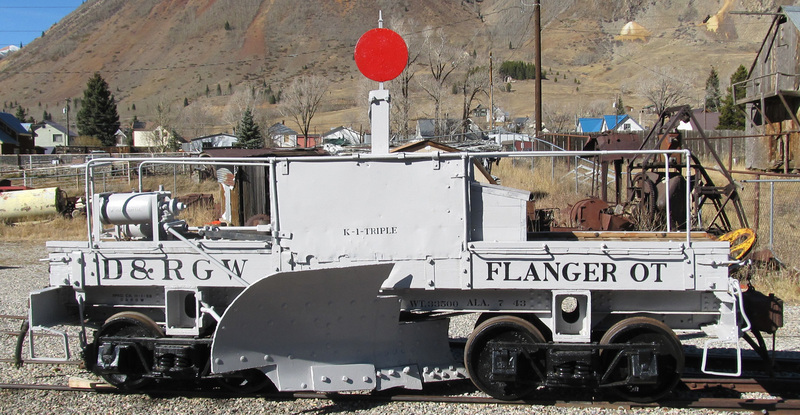 D&RGW Flanger OT was rebuilt in 1942 and much of the wooden frame was replaced with steel so no major structural work was needed. However some of the pipe work and operating equipment had been fitted later in the cars’ history and these were removed and the car reverted to its earlier guise just after it was rebuilt. It carries the later grey paint and has been re-lettered. And here are some of our projects….